Seriously, what was I thinking? Scheduling a dentist appointment? The morning of an infusion set change? The morning of the Royal Wedding? How could I have possibly overlooked such things? 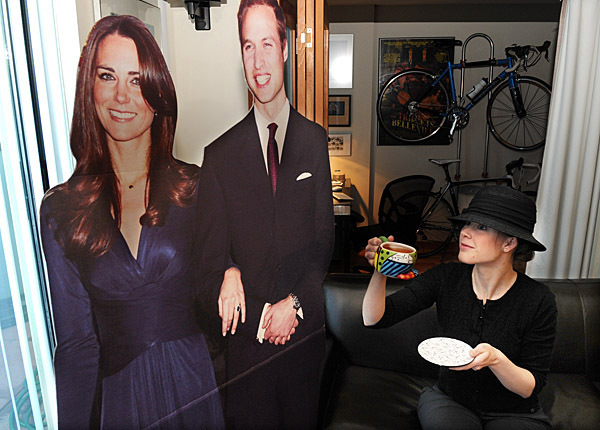 But let me just say when you live in a loft, wake up at 4:50 a.m., come out of the shower and are half dressed and you see the Duke and Duchess of Cambridge standing in your living room, when you completely forgot they were coming, I bet you’d scream too! I LOVED the wedding! I got up at midnight and watched it live until 6am! I love weddings. I also LOVE your hat in this photo and am quite envious of it. I also LOVE hats! how the hell do you have gigantic cardboard stand-ups?